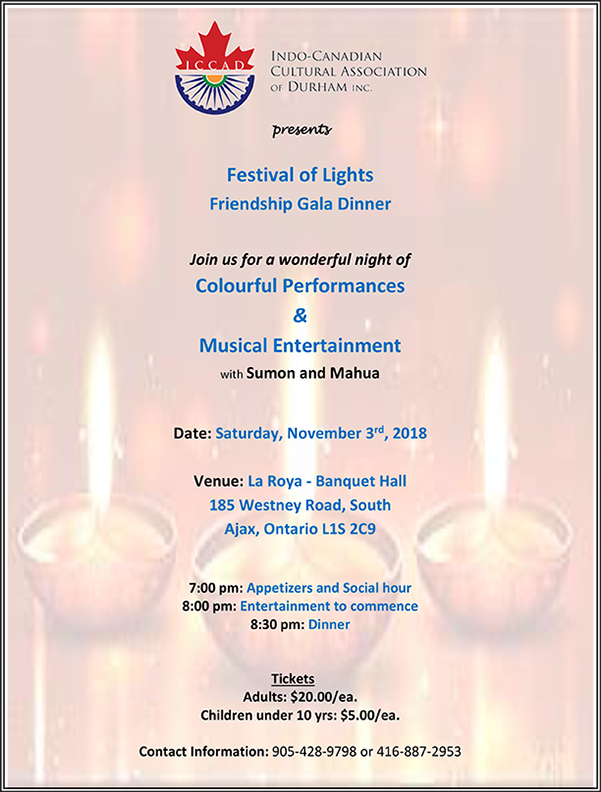 ICCAD celebrated it annual event “Festival of Lights” (Diwali) and Friendship Gala Dinner at La Roya Banquet Hall in Ajax, Ontario. On this occasion ICCAD also were proud to honor Inspector Cathy Bawden of Durham Regional Police Service for her dedication and Commitment to Diversity, Equity and inclusion efforts at Workplace. ICCAD celebrated Festival of India’s Heritage and 71st Anniversary of India’s Independence day at Pickering city hall with the India’s national Flag raising ceremony by the Mayor of Pickering along with other dignitaries, with a grand peace march, an entertainment program consisting of colorful dances items and offering of Snacks and drink of water to all attending. ICCAD celebrated its annual Festival of Lights (Diwali) with a grand gala dinner, dance and entertainment evening at La Roya Banquet Hall in Ajax, Ontario. The theme was “Celebrating Brave Hearts” to acknowledge and honor selected individuals who had survived the trauma of Cancer. ICCAD Seniors Group is organizing a fun trip to NIAGARA-ON-THE-LAKE on August 9, 2015. The bus tour will cover the Brock monument, Flower Clock, OPG power plant, Botanical Gardens, the Buddhist Temple and Niagara Falls. Tickets are on sale now (going fast - book early to avoid disappointment) at $30 which includes breakfast and snacks. An optional lunch is offered at the "Passage to India" restaurant at $5. CANADA DAY AT KINSMEN PARK - JULY 1. (Brock Rd.N-Right onto Montgomery Park Rd W, Right onto Sandy Beach Rd.N). ICCAD HOSTS SAREE-WRAPPING, FREE HENNA TATTOOS! There will also be Delicious samosas , snacks & drinks for sale. ICCAD FAMILY PICNIC. Sunday, July 05, 2015 11am - 4 pm. A family fun event at Lookout Park (take Whites Road South, turn Left on Donland Drive). FUN ITEMS FOR ALL AGES - TO ENJOY GAMES, DELICIOUS VARIETY OF LUNCH AND SNACKS - games, music. All are welcome! . ICCAD Seniors Group along with families and friends enjoyed an informative and enjoyable trip to the religious places of worship in the greater Toronto area. The tour covered a Hindu Mandir, Gurudwara, Christian Lutheran Church and a Masjid. As all enjoyed this successful trip, many requests have arrived for more such cultural & religious information tours so please await announcements on our next one!. South Asian & Asian Heritage Month provides an excellent opportunity for Asian and South Asian Canadians to come together to celebrate and share their heritage and culture while providing an opportunity for Canadians across the country to reflect on and celebrate the contributions of Asian and South Asian Canadians to the growth and prosperity of Canada. The South Asian and Asian community has long enriched Canadian society with skills, knowledge and talent, and continues to contribute to the social, economic, cultural and political fabric of our country. Once again the Indo-Canadian Cultural Association of Durham, in partnership with the Town of Ajax, the Canadian Afghan Council, the Pak-Canadian Friendship Society “Friends indeed”, Bangladeshi Canadian Community Center, the Nepalese Canadian Community Centre, the Durham Tamil Association, the Tamil Cultural and Academic Society of Durham, the Durham Chinese Canadian Cultural Centre, the Durham Asian Cultural Association, Filipino-Canadian Heritage and Resource of Durham and Chinese-Canadian Heritage Society, in hosting a celebration of the sub-continent’s rich cultural heritage. The ICCAD along with it partners will be hosting “Cultural and Heritage Display”, “Cultural How to’ and “Cultural Cooking Show” on May 17 at McLean Community Center from 3-5pm and conclude the festival with a Cultural dance performance and musical presentation on Saturday May 23rd at 7pm at the St. Francis Auditorium of Art and Culture in Ajax. Free Event: Everyone is welcome to join us. The Indo-Canadian Cultural Association of Durham in partnership with the Intercultural Dialogue Institute, the Filipino-Canadian Heritage and Resource of Durham and the Town of Ajax is hosting a youth conference entitled "Leader of Tomorrow" at the St. Francis Centre of Arts and Culture located at 78 Church St. South, Ajax at 3:00 pm. The conference hopes to address a lack of knowledge among the youth of our culturally diverse Region about the options available to them as they pursue higher education and potential career paths. Both the Canadian Arm Forces and Durham Regional Police Services's presentations at the conference will help our youth that they have an option available to them to serve our country in uniform. ICCAD organized a ‘friendship tour’ inviting the Pickering-Ajax Italian Social /club and the Filipino Canadian Heritage & Resources of Durham to join with ICCAD members and Seniors group to Thousand Islands. The tour was instrumental in cultivating friendship and understanding among diverse communities, thereby laying foundations to building strong relationships with fellow Canadians. ICCAD takes a lead in building bridges among diverse communities of our region, taking steps necessary to reach its primary goad of tolerance and brotherhood. ICCAD was a proud partner with the Intercultural Dialogue Institute of GTA and the Town of Ajax to organize an Iftar celebration dinner and entertainment evening. ICCAD recognizes and appreciates IDI’s continued efforts to promote mutual understanding among people of all faiths and cultures through dialogue and partnership, thereby contributing to the Canadian vision of Togetherness. The event was attended by Chris Alaxander Minister of Immigration and Citizenship, Durham Chair Roger Anderson, Mayor of Ajax, Mayor Parish and community leaders, sharing commonality values . Ms Bhatia welcomed the dignitaries and the attendees. Dan Carter, president of ‘Day of Hope Peace & Leadership’ was the key speaker, giving an inspirational speech encouraging Humanity. The celebration commenced with a classical Indian dance and a guitar recital, and was followed by a gourmet dinner. The ICCAD booth at the grand Canada Day Celebrations at Kinsmen’s Park was one of the most visited among all, and was a great success. There were line-ups for henna painting and samosas. Our booth was active from noon till late night when the festivities ended with the fireworks display. A big thank you to all the volunteers! The annual ICCAD picnic was held at Lookout Point park on June 22 attended by over 80 people. Cricket and other games were organized, and an impressive array of sumptuous appetizers , main courses and delectable desserts were served. The picnic was enjoyed by all, and carried on from noon till 5pm. Our grateful thanks to the generous contributors. The Indo-Canadian Cultural Assoc. of Durham (ICCAD) Seniors group met on Tuesday May 27, 2014 for a pot luck lunch at the Pickering Recreational Complex. Immediately following lunch, a financial awareness presentation was given by Alice Alemao, a representative of Primerica Financial Services. The presentation focussed on simple, easy financial concepts like, how money works, how to protect your retirement assets, minimize taxes, and maximize returns. The event was well attended. The presentation was very informative and educational especially for those who had no prior financial knowledge. Alice explained in great detail how money grows, how mutual funds work and different investment strategies for seniors and their families. Alice provided the members with common sense estate planning strategies and ideas for transfer of wealth. Most noteworthy aspect of the presentation was that it provided, in a nutshell, financial literacy for women. The women members were happy to learn basic concepts of money and finance, a task they normally entrust their husbands with. The presentation was very interactive and members asked many questions followed by discussions. Shashi Bhatia thanked Alice for the wonderful presentation and expressed her appreciation for the work Alice is doing in the community. For more information about the ICCAD programs please contact at 905-428-9798. The Indo-Canadian Cultural Association of Durham (ICCAD) partnered with Town of Ajax hosted two days festival to celebrate “South Asian and Asian Heritage festival on May 16 and May17 in St. Francis Centre of Art and Heritage. On May 16 thanks to RBC who sponsored a Bollywood film, and on May 17 partnered with the Canadian Afghan Council, The Pak-Canadian Friendship Society, the Nepalese Canadian Community Services, Bangladesh community Services, the Durham Tamil Association, the Tamil Cultural and Academic Society of Durham, Durham Asian Cultural Association, Durham Canadian Chinese Culture Centre, Intercultural Dialogue Institute GTA (IDI), Filipino-Canadian Heritage and Resource of Durham and Laos Association of Ontario hosting a celebration of the sub-continent’s rich cultural heritage. The well attended Festival was Durham’s enthusiastic response to the Ontario and Canadian Government proclamation designated May as South-Asian and Asian Heritage month respectfully in commemoration of the many people of the South Asian and Asian heritage who made new lives in Canada. With South Asian and Asian making up a significant proportion of Ontario’s population the Festival was able to draw upon the talents, heritage and traditions represented by participating groups. Said Shashi Bhatia “it is those traditions that contribute to making the Durham Region a place that we can be proud of and is what the Festival celebrates. Thanks to our enthusiastic volunteers of all ages who made this event a success. Indo-Canadian Cultural Assoc. of Durham (ICCAD) is proud to have led a team of leaders from Durham’s diverse community associations to honour the outgoing DRPS Chief of Police Mike Ewles who was committed to inclusiveness and building communities partnership with organizations broadly representative of our growing Region. Mike Ewles’ gave his unwavering support to several diverse community organizations in Durham, primarily ICCAD. Please click here for photos. August 25, 2013. - ICCAD celebrated another of its annual events - Festival of India's Heritage and the 66th Anniversary of India's Independence on a grand scale. Flag raising ceremony took place at that the Pickering City Hall followed by the cultural program at the Pickering Town Centre. Mayor Dave Ryan, Deputy Consul General of India and many elected leaders and several hundred attended the flag hoisting ceremony at the Pickering City Hall, followed by a cultural concert depicting the cultural integration of India and Canada. A big “Thank You” to all who contributed to the success ICCAD’s annual picnic! 85 attended and had fun playing games, cricket, kite-flying and enjoyed a wide array of delicious snacks and lunch. A special ‘Thank you” to the volunteers – you make it happen always! The ICCAD is taking a bus tour to Ottawa on May 21, 2013 from Ajax . This is an educational trip where we all will get an opportunity to take a tour of the Parliament Hill, its library and the Canadian House of Commons: Q & A session. We will also get a chance to interact with MP Chris Alexander, Canada's Parliamentary Secretary to the Minister of Defence, Peter Mackay and possibly Hon. Jason Kenny the Minster of Citizen and Immigration. Cost $40 each Breakfast, lunch, snacks, pop and water included. Bus leaves at 6am sharp from Durham Centre located at Harwood and Kingston Road. ICCAD will participate in City of Pickering ARTFEST on the Esplanade May 25, 11am – 5 pm. If you would like to learn how to wear a saree, paint henna or dance Bollywood please join us at the Pickering Library at the Artfest, May 25. Like NRI’s across the world I was shocked and appalled by the barbaric violence against the innocent young woman on a bus in Delhi. It was a terrible indictment of some of the attitudes prevalent in segments of Indian society. Much of my efforts are aimed at promoting the interests of a progressive vision of India and such dreadful incidents do nothing but sully India’s name. Sadly this tragic event illustrates one of the problems faced by Indian society. For all its progress there is still an undercurrent where women are seen as possessions to be used and not as valuable beings in their own right. We must all set our minds and efforts to eliminate the misogynist views that led to the cruel death of this twenty-three year old young woman. That she would meet her death in such a violent manner is a sad reflection on contemporary Indian society. In this 21st century, we seldom get an opportunity to celebrate and get involved in social events which depict our rich culture and heritage. As we progress to an entirely new era of technology, these deep rooted values which bind us together as a family and as a society seem to be fading away gradually. To make sure these traditions do not lose their charm, Indo Canadian Cultural Association of Durham hosted this spectacular festival of "Navratra" at Ajax Community Centre on October 27. It was yet another breathtaking event hosted by ICCAD and was attended by approximately 300 people. It was great to watch the enthusiasm with which the revellers and the international students of Durham College were dressed up in their colourful traditional outfits. They were seen rejoicing and putting their best foot forward to the tunes of "Garba" and embracing their rich contemporary culture. The festival kicked off a bit early but as darkness fell, large groups including both, adults and children were seen flocking towards the venue to quickly swing into the festive mood. It were the performers who left the crowd stunned with their awesome performances and tub-thumping music. It was a dream comes true for the new international students of Durham College as they were awestruck to find themselves enraptured in a rhythmic and vibrant ambience which was no different from their home country. Also termed as a major stress buster, the students were spotted grooving to the sounds in both, large and small groups with hours of continuous dancing. The intoxicating synchronized sounds of hand claps and "cluck-cluck" of the dandiyas left the onlookers dazzled as they cheered on top of their voices throughout the event. The students who comprised of the audience were also seen charged with energy and devotion to celebrate this festival of Goddess Durga. An opportunity to celebrate a cultural festival in a different country is an experience in itself, as it was evident from the fact that the students of Durham College wanted the event to further continue that they lived the moment to the fullest. At midnight, even when the music began to slowly fade away, the faces of everyone in the hall were still lit with interest and a gleam of excitement as they craved for more but only one thing could be promised - "We will return with a Bang, next year". The Indo-Canadian Cultural Association of Durham (ICCAD) partnered with Natraj Youth Cultural Organization was proud to host the celebration of Non-Violence day on Saturday Oct. 6th at the OPG auditiorium in Pickering. Deputy Mayor Doug Dickerson, Tracy MacCharles MPP, Joe Dickson MPP, Regional Chair Anderson, Councillor Raymond Cho, Councillor Peter Rodreigues, Inspector Jamie Grant of DRPS, and many community leaders and guests were present at the event. Regional Chair Anderson, Chris Alexander MP and Joe Dickson MPP sent greetings and among elected leaders Terry Spratt a retired teacher of English and World Religions with an interest in International Relations from Baha’i faith and Vaqur Raees President of Pakistan Friendship Society of Durham also addressed the audience on a topic of Non-iolence. The ICCAD is committed to doing everything possible to expose violence for the evil it is and to work in any way we can to eliminate it. Sptember 14, 2012 Deer Creek Golf and Banquet On behalf of Her Majesty Queen Elizabeth II, Senator Vern White was pleased to award Ms. Shashi Bhatia Founding Chair of the ICCAD the Queen Elizabeth II Diamond Jubilee Medal, created to mark the 60th anniversary of Her Majesty`s accession to the Throne. In granting Ms. Bhatia this honour, Senator White thanked her for her dedicated service to her peers, to the community and to Canada and the contributions she have made to our nation is most commendable that deserve our praise and admiration. Medals were presented on Friday, September 14, 2012 at 6:00 p.m. at the Deer Creek Golf and Banquet Facility in Ajax at the Durham Regional Police Service Award Gala Event. 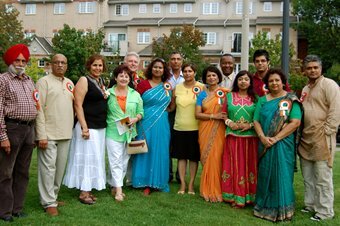 Pickering:- The Indo-Canadian Cultural Association of Durham (ICCAD) was proud to host for seventh consecutive years the “Festival of India’s Heritage” on Sunday August 19, 2012 including the celebration of 65th Anniversary of India’s Independence. Mayor Ryan, Counsel General of India, Chris Alexander MP, Chisu Corneliu MP, Tracy MacCharles MPP, Inspector Jamie Grant of DRPS, Don Lovisa president of Durham College, many community leaders and hundreds of guests were present at the event. The ICCAD is a representative of Indian diaspora and is comprised of members from a broad range of various ethnic and religious backgrounds. These broad and diverse communities represent significant economic and cultural interests in Durham Region. 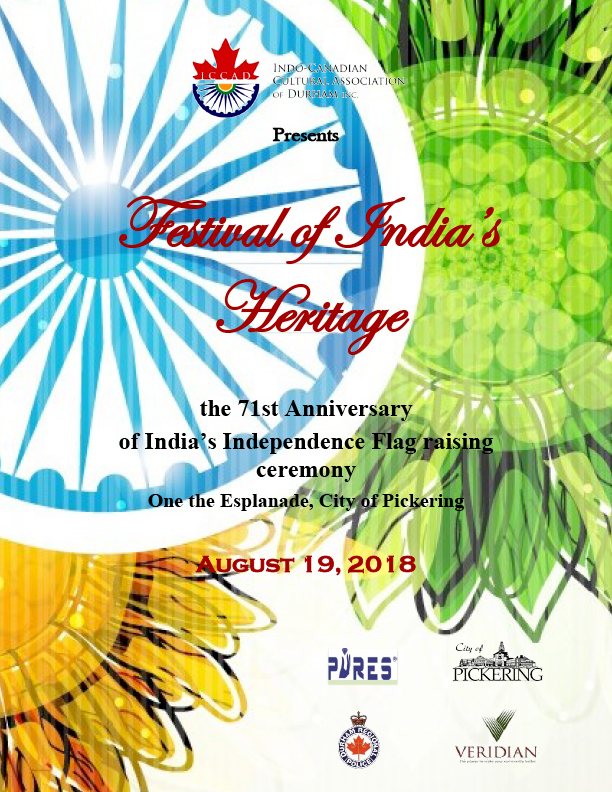 The India’s national flag “Tiranga” raising ceremony at the Pickering city hall was kicked off the festival that had become an annual tradition that spoke to the inclusive nature of the Durham Communities. A colorful cultural program featured a variety of music and dance show. This year’s festivities were bigger and better than ever. Guest enjoyed art exhibit, fashion, jewelry and food stalls. On behalf of Government of Canada Prime Minister The Rt. Hon. Stephen Harper commended ICCAD for organizing the joyous celebration. “I am proud to state that the Indo-Canadian residents are important community partners and leaders” said Mayor Ryan. India’s High Commissioner Mr. S.M. Gavai congratulated ICCAD for hosting the festival of India including celebration of India’s Independence. Premier Dalton McGuinty recognized this important day and commended the ICCAD’s for its commitment to promoting and celebrating the cultural vibrancy of Durham Region and Don Lovisa President of Durham College applauded the ICCAD’s work and acknowledged that Durham Communities are much stronger and vibrant due to the diversity in Durham region. There is much that connects the vibrant democracies of India and Canada. Not only they are homelands we can be proud of, but in the Durham Region as in Canada we enjoy freedom of choice and freedom of voice and freedom to celebrate our differences together said Shashi Bhatia founding member of the ICCAD. The ICCAD was grateful to the Counsel General of India, Durham Regional Police Service, Veridian, OPG, Durham College, many sponsors and terrific performing artists together with the hardworking members, many volunteers and attendees for joining in the celebration India’s Independence Day. On July 01, 2012, in the celebration of Canada Day, Indo-Canadian Cultural Association of Durham Inc., have proudly donated a Commemorative Bench to the Millennium Square of the City of Pickering, located at the Liverpool road south on the water front for everyone to enjoy the scenic beauty of the lake Ontario and many other festivities. Please join us to celebrate “Canada Day” at the Kinsmen Park, hosted by city of Pickering. It is an explosion of free fun on July 1st .starting at noon hour. Family show starts with Stage Entertainment, rides at Kids’ park, family community party, live musical performances by Suzie McNeil and stunning Giant Pyromusical fireworks. On Sunday, June 24, 2012, Indo-Canadian Cultural Association of Durham (ICCAD) proudly hosted the Annual Picnic and park clean up campaign at the Lookout Point Park, Pickering. Ontario. Our picnic was well attended. People of all ages and back-grounds joined us to make this day a fun day. While many adults enjoyed playing Cricket our youngsters had fun flying kites. Our Kho-Kho team is a winner of all. In the end “ Intaakshari” brought us back to 60s, 70s, and 80s. Delicious hot lunch was served. Our heart felt thanks to MPP Tracy MacCharles Mayor Dave Ryan and Regional councilor Peter Rodrigues and representative of Chris Alexander MP for Ajax-Pickering for attending ICCAD’s annual picnic and park clean- up to keep our city environmentally clean and safe. On Wednesday, June 20, 2012, Indo-Canadian Cultural Association of Durham Inc. (ICCAD) proudly presented a unique Classical Indian Dance show, hosted by Oshawa Public Libraries of the McLauglin Branch at 65 Bagot Street, Oshawa during “Fiesta Week”. Indian classical dance Bharatnaytam, Kathak, Bollywood and Dandiya dance were very well received and enjoyed by the house full capacity of the auditorium. Our heartfelt thanks to the performers, organizing committee, volunteers and Oshawa libraries that helped made the evening a huge success. The Indo-Canadian Cultural Association of Durham hosted a celebration of “South Asian Heritage Festival” which was a resounding success. Our heartfelt thanks to all the organizing committee, artists, participants, volunteers, partners, elected leaders, leaders of our community and most importantly people of all walks of like who joined us to mark this day as South Asian Heritage Month. The excited program presented marked a very important first. This was a first time an event of this nature has been hosted in Durham region where the ICCAD partnered with the Town of Ajax, Canadian Afghan Council, Pak-Canadian Friendship Society of Durham, D-Matreek, the Nepalese Canadian Community association, The Durham Tamil Association and the Tamil Cultural and Academic Society of Durham in hosting a celebration of the Sub-continent’s rich culture heritage. South-Asians make up a significant proportion of Ontario’s population as they do in the Durham Region, and we were proud to draw upon the heritage and traditions of those who have come before, contributing as they have to many aspects of culture, commerce and public service. Mr. Chris Alexander M.P. Canada’s former Ambassador to Afghanistan MC the event with Shashi Bhatia. The Indo-Canadian Cultural Assoc. of Durham Presents “South Asian Heritage Festival 2012” partnered with the Town of Ajax, the Afghan Community Council, the Durham Tamil Association, the Tamil Cultural and Academic Society of Durham, Friends Indeed Canada, d-Maatrik and the Nepalese-Canadian Community Services. Month of May 2012 is proclaimed as “South Asian Heritage Month” by town of Ajax on April 23, 2012. Cultural events throughout the month will culminate in a celebration of Arts and Culture to be held at the St. Francis Cultural Centre in Ajax on Saturday May 26th at 4pm. The celebration included an art show, heritage displays and music and dance performances presented by the south Asian cultural groups. As well we are fortunate to be screening the compelling Afghan film ‘An Act Of Dishonour’ directed by Nelofer Pazira critically acclaimed internationally as the star of “Kandahar” and co-director the widely praised documentary ‘Return to Kandahar’. (Image is everything campaign) Rouge Valley, Ajax / Pickering Hospital on March 12, 2012.
will help ensure that there is the best health care available close to home. ICCAD thanks its members who helped making this possible." The Indo-Canadian Cultural Association of Durham a proud partner with the city of Pickering, participated in a “Heritage Day” Celebration on Feb. 25, 2012 at the Pickering Town Center. Together with our display table exhibiting artifacts of Indian art and heritage the ICCAD show-cased it culture by dance and music. Our efforts were applauded by city officials, leaders of the community and a large audience of all back-ground. Thank you everyone for coming to our Ras-Garba event and made it very successful. The Indo Canadian Cultural Association of Durham (ICCAD) Health and Wellness Symposium took place on July 16 at Pickering Recreation Complex from 10am-4pm. This Symposium raised the level of awareness and education on chronic disease, and allowed all communities particularly South Asian community to become proactive, self-aware and to co-management their disease with health professionals, while maintaining cultural and ethnic sensitivity. Keynote speakers were respected community health professionals with chronic disease perspectives that are relevant to all Canadians. 15 vendors including City of Pickering-Health and Fitness, Canadian Blood Services, Courtyard Chiropractic Health Center, Lotus Esprit, Eat Right, CER Cancer program, Ayurvedic lifestyles inc. USANA Health Services, Nutrition Therapy, Central East CCAC, St. John Ambulance just to mention few, showcased their products, services and tools that were cost effective and easy to use for all. The ICCAD appreciated Chris Alexander MP, Joe Dickson MPP, Durham Chair Roger Anderson, Mayor Dave Ryan, Dr. Romas Stas, Dr. Khan, Dr. Bhargava, Officer Corey Walsh, Chief Mike Ewles DPRS and EcoHealth Canada for their commitment to health and wellness as they were our partners in Unity and Harmony towards a bright and healthy future. Our heartfelt thanks to Minister Leona Aglukkaq minister of Health Canada and Minister Margarett, Best, minister of Health Ontario who recognize the importance of a healthy lifestyle in preventing chronic diseases and applauded our commitment to health and wellness. This event would not have possible without our partners City of Pickering and EcoHealth Canada Inc. Our heartfelt thank to the members of the organizing team, volunteers and many friends who made this day a huge success.